Upon becoming a new mother, Eula Biss addresses a chronic condition of fear-fear of the government, the medical establishment, and what is in your child's air, food, mattress, medicine, and vaccines. She finds that you cannot immunize your child, or yourself, from the world. In this bold, fascinating book, Biss investigates the metaphors and myths surrounding our conception of immunity and its implications for the individual and the social body. As she hears more and more fears about vaccines, Biss researches what they mean for her own child, her immediate community, America, and the world, both historically and in the present moment. She extends a conversation with other mothers to meditations on Voltaire's Candide, Bram Stoker's Dracula, Rachel Carson's Silent Spring, Susan Sontag's AIDS and Its Metaphors, and beyond. 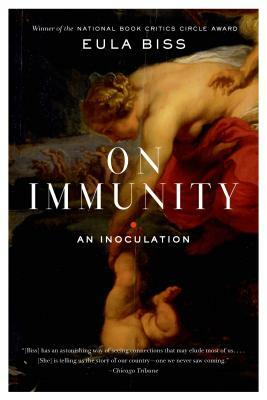 On Immunity is a moving account of how we are all interconnected-our bodies and our fates.